This is a subscription based game, monthly payment is required in order to access higher level content. Alternatively in-game currency can be spent to extend game time. As of November 2016, the game is free to play using the 'Alpha clone state', with access to limited skills and ships. Paid accounts are in the 'Omega clone state' and have access to the full game. Large and active community with over 500,000 subscribers as of February 2013. 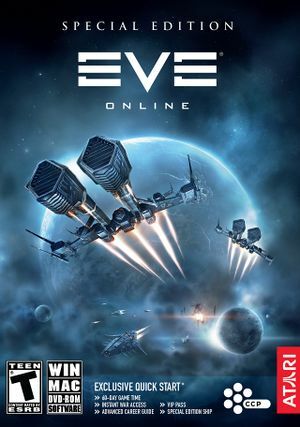 All versions require an EVE Online account. The game is free to play in the 'Alpha clone state', with restrictions on availability of skills and ships. On Windows c_eve_sharedcache_tq_tranquility can differ depending on the EVE Online installation folder. Minimum screen resolution is 1024x768. Use "Fixed Window" under "Windowed or Fullscreen" to unlock Multi-Monitor Resolutions like 3840x1080. Set Display > Present Interval to "Interval immediate" in settings to unlock the frame rate. Not specified in audio settings but uses the operating system's surround sound settings if present. Enabled using "Inactive Client Muting". You must deactivate the GX Button in the driver software. 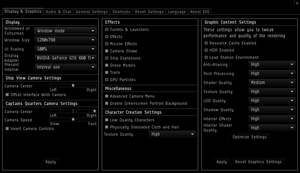 You must disable FXAA in Nvidia Control Panel. ↑ File/folder structure within this directory reflects the path(s) listed for Windows and/or Steam game data (use Wine regedit to access Windows registry paths). Games with Steam Cloud support may store data in ~/.steam/steam/userdata/<user-id>/8500/ in addition to or instead of this directory. The app ID (8500) may differ in some cases. Treat backslashes as forward slashes. See the glossary page for details. This page was last edited on 22 April 2019, at 05:04.